After a lengthy period of moving their wind tunnel operations to Toyota’s facility in Cologne, Germany, Force India have finally produced the first of a series of aerodynamic modifications to the VJM08. The team essentially started the 2015 season with a modest revision of its 2014 car but now – with the fire power of new employees from Red Bull and McLaren – the new package meets up to the current standard of F1 developments. Toyota’s wind tunnel is larger and their computing power is far greater than what Force India had at their base just minutes away from the Silverstone circuit. Eventually the team aim to use a larger scale model (60%, up 10% over what they currently use) of the car, which is actually significantly advantageous – Mercedes jumped up to a 60% model during mid-2012 and the results started to come the following year. As aerodynamics are by far the biggest performance differentiator in Formula 1 at the moment, it is important the the whole infrastructure of the team is focused around a solid aero programme. It is just one of many elements that form a strong team, but the aero side is the backbone of it all. Considering Force India’s relatively modest budget, this is a massive step in a positive direction for them. The new aero package is instantly distinctive thanks to its unique redesign of the nose. The front wing is also completely new, with a clear emphasis on the Red Bull philosophy of spanning elements across the entire width of the available wing area and using a fundamentally similar cascade winglet design to control airflow around the front tyres. However the nose is the centrepiece of the entire upgrade. Dubbed by the team as the ‘vented cobra’ (for quite obvious reasons), the nose itself is virtually unchanged except for the two nostrils that have been cut into it. It retains to two cross distinct cross sectional areas to meet the regulations – the thumb tip extension leading a much wider but thinner section behind, forming the ‘cobra’ shape. The nose did require a crash test despite the outwardly minimal changes, as the angle that the nostrils are cut at has a substantial impact on the structural integrity of the item. So what are the nostrils trying to achieve? We all know that there is a great importance on getting good quality airflow beneath the chassis/nose to work the front splitter harder and generate more downforce at both the front and rear of the car. 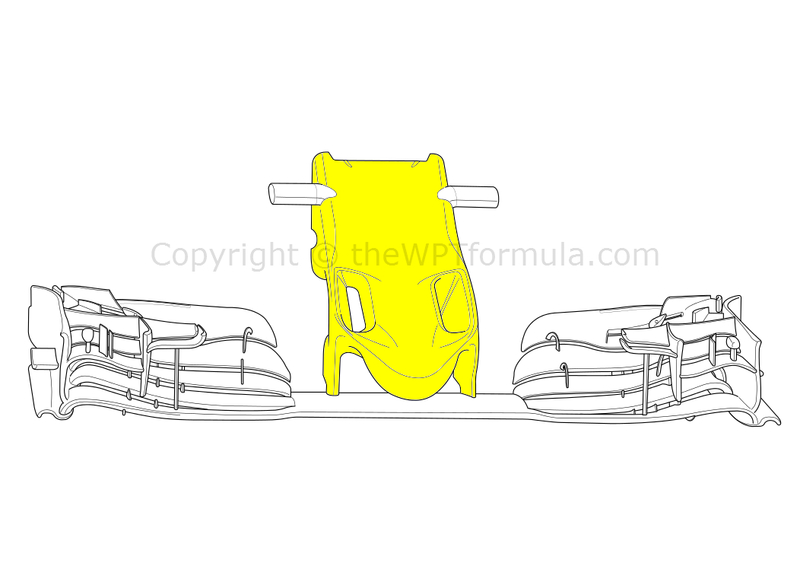 The holes cut into the nose allow air to pass straight through and into a prime position for the splitter to feed off – the exits of each hole are right along the centreline of the car directly ahead of the front bulkhead. The regulations dictate that the nose must always form a single cross section at all points, so surely punching a hole straight through is illegal? Not if done correctly! When taking a cross section across Force India’s nose horizontally, a hole is never actually formed – instead a large cavity at most is visible, which still makes for one single cross section when viewed from the side. This is because the nostrils are cut at a slightly twisted angle, from the outer edges of the top surface of the nose to the centreline of the car on the bottom. It’s a clever interpretation of the rules as most teams have perhaps just considered looking at the cross section rules from a front-to-back perspective, which would make the nostrils nose illegal I would suspect. This is not to say that other teams haven’t tried this layout of nose but it’s interesting that Force India have elected to choose this direction for future development. Further back, the VJM08 is a now a completely different beast. Unlike any other Mercedes-powered team, the gearbox oil radiator is now tucked into the sidepods rather than above the gearbox, resulting in the removal of the ear inlets eitherside of the rollhoop which would have previously cooled the aforementioned radiator. To further maximise this new achievement, the engine cover has been heavily shrink-wrapped around the internals below, creating a striking look and an instantly distinctive shark fin lining the spine of the car. This clears more space ahead of the rear wing, increasing the efficiency of the rear aerodynamics. Underneath the engine cover a few more changes were made to the rear wing pylon and exhaust exit pipe. The pipe no longer has to make way for the previously-wedged in gearbox oil cooler, so it now sits nice and flat along the top of the gearbox case. As the solution is much tidier, the base of the rear wing pylon can now wrap tightly around the pipe to form the Y-lon shape that we commonly call it. Detail touches such as these can save weight and improve cooling. The sidepods were also heavily revised, featuring a Mercedes-esque profile to the inlet area – which is now much smaller in surface area – and their shoulders. The compensate for the new design, the vertical turning vanes that flank each sidepod have been tweaked to suit the raised edges of the ‘pods to improve downwash of air towards the floor. Finally, the entire floor has been revised to produce more downforce, including a whole new diffuser and bargeboards. Along with some mechanical changes to the rear suspension geometry, Force India’s virtually new car is quite something to behold. Previously in the season they were really struggling for downforce, but Nico Hulkenberg qualified in the top 10 at Silverstone – it is fair to say that the upgrade has produced a significant step forward for them. 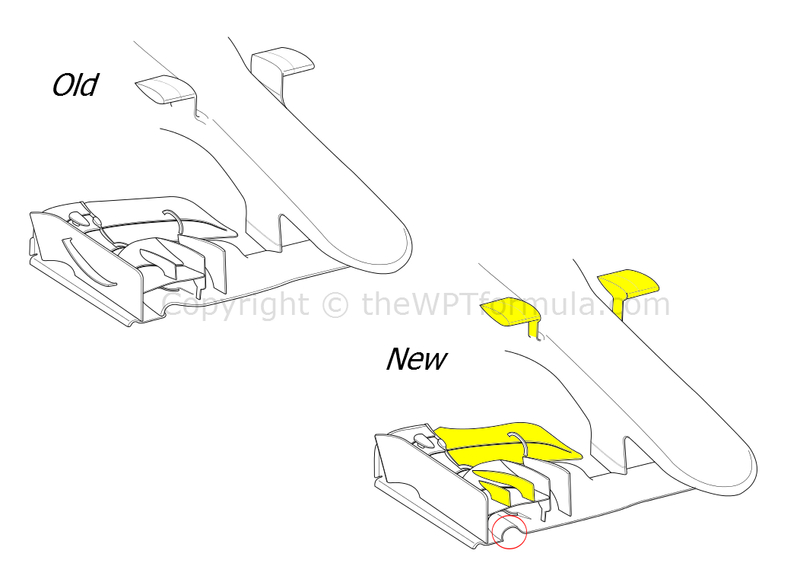 The Scuderia continue to bring small changes to the SF15-T race by race, this time at Silverstone in the form of a new front wing and additional touches to the floor and rear brake ducts. Highlighted above are the key changes made to the front end of the car. The upgrade revolves around the outboard section of the wing and how the rise in profile of the region generates a vortex around the front tyre to improve outwash. This benefits both overall downforce and airflow management downstream. Firstly, the section in question (circled) has had a heavy influence from Mercedes. In China the Silver Arrows produced a more aggressive front wing which featured a much more pronounced look the the vortex ‘tunnel’. Ferrari have followed suit, although perhaps not quite as extreme as Mercedes. Above on the main cascade winglet are now two turning vanes to assist airflow around the front tyre, vorticising it in the process. The top flap has been extensively re-profiled, too, and appears to be set at a much lower angle of attack than before. Perhaps they have found a solution which files airflow through the front suspension and brake ducts more efficiently with this new design, decreasing drag simultaneously. The endplate vane has also been deleted, leaving a bare fence to further push air around the tyre. Note also the camera pods, which, whilst not exactly new, now follow Mercedes in terms of their slimmed down look. Two tiny stalks now connect the pods to the nose, rather than the wider turning vanes previously. This entry was posted in 2015 Highlights, Technical Highlights and tagged 2015, b spec, british gp, car, f1, ferrari, force india, highlights, nose, nostrils, tech, upgrades on July 7, 2015 by thewptformula.